Yesterday the FBS Selection Committee came out with their rankings for college football. This is important because the top four teams get to be in the FBS playoffs for the national championship (why we can't have a regular playoff, I don't know). The University of Washington Huskies are #5. Texas A&M is #4, even though they are 7-1 and the Huskies are 8-0. The general feeling is the strength of schedule is what hurt UW. Those three easy, at-home games we played at the beginning of the season against Rutgers, Idaho, and Portland State. However, if the Huskies manage to go 12-0, which they have a good chance of doing now that they beat Utah, the selection committee would be hard pressed not to have them at least #4 and in the playoffs. Cup. The game is in Pullman, which makes it harder to win. The Cougars are in second place in the Pac-12 North (under the Huskies) with a 6-2 record but are 5-0 in conference, just like the Huskies. The Cougars are looking better and better as the season goes on. 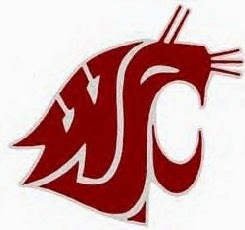 And it is well known in Washington State that the Apple Cup is always a game unto itself. One year Washington was vying for Conference Champion and the Cougars were the doormat of the conference, and they still beat the Huskies in a very snowy game in Pullman. So we have to watch the FBS poll from now on. This Saturday the Huskies take on the California Golden Bears in Berkeley. Then they come home for two games (USC and Arizona State) then the travel to the Palouse to play the Cougs the day after Thanksgiving. Then a week later (December 2nd) is the Pac-12 championship game between the winner of the North Division and the South Division. I'm planning on the Huskies being in that game. Oh, and the only other Pac-12 teams ranked by the FBS Selection Committee are Colorado (don't play this year), Utah (already beat), and Washington State.